StarDot Technologies, a US based designer of digital cameras for the past 18 years, has introduced a new security camera technology which has the potential to shake up the industry. This new technology was recently featured at ISC West 2013, where it won an honorable mention award at the New Product Showcase, in the category of megapixel surveillance cameras. 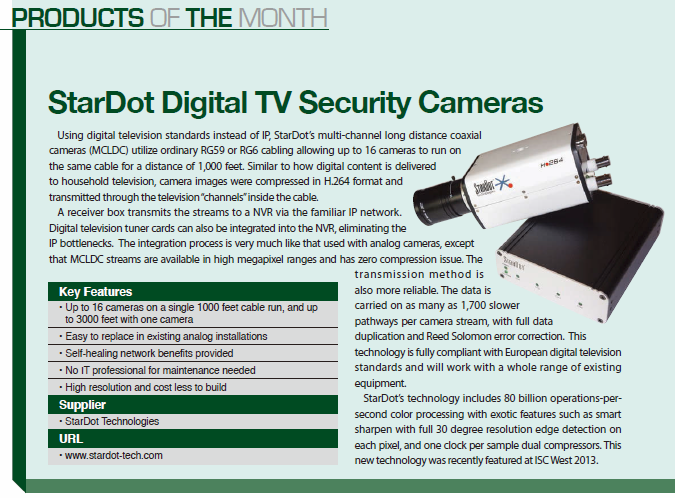 Using digital television standards instead of IP, StarDot’s Multi-Channel Long Distance Coaxial cameras (MCLDC) utilize ordinary RG59 or RG6 cabling. Up to 16 cameras can share the same cable run for distances of 1000 feet. Cameras appear as H.264 format television “channels” inside the cable, similar to how digital content is delivered to your home. A receiver box presents the streams to NVR software via the familiar IP protocol. Digital television tuner cards can also be integrated into the NVR computer, completely eliminating IP bottlenecks. The integration process is very much like that used with analog cameras, except that MCLDC streams are available in high megapixel ranges and put no compression burden on your NVR. Costs less to build, carries higher resolutions.